There’s of course the famous scene where Margot Robbie takes a bubble bath and talks directly to the camera to explain mortgage bonds. Many critics are praising director Adam McKay to know that that’s the type of scene this movie needs to have – an audience isn’t going to listen to a finance diatribe otherwise, and Margot Robbie in a bubble bath is the only thing they’ll pay attention to. I will agree that McKay really isn’t talking down to the audience but finding a common middle-ground. We all like hot movie stars, and here’s the financial reality. However, it needs to be pointed out that people are only going to remember Margot Robbie covered in bubbles, not what she actually said. It does however get the audience more fully invested in the movie, and that’s probably the bigger point. from Paramount Pictures and Regency Enterprises. Photo credit: Jaap Buitendijk © 2015 PARAMOUNT PICTURES. ALL RIGHTS RESERVED. The most interesting things accomplished by this movie were the characters that we’re following around. 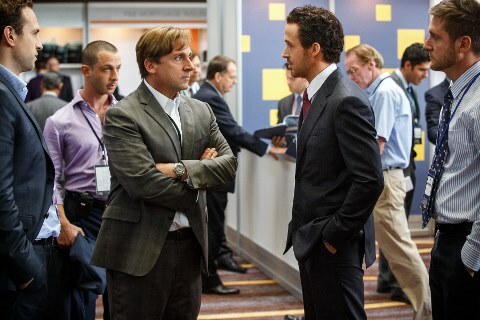 A main character is Christian Bale’s Michael Burry, a very socially-awkward money manager. Can’t lie, doesn’t understand most social interactions, is honest, but uncaring, and he’s a genius with finances. Bale really opens the audience up to him. This is a smart guy, who isn’t going to pull any punches, and his bluntness is endearing, not off-putting. Obviously he’s our protagonist, and one that we’ll happily root for, but keep in mind that he’s one of the guys profiting from the common man’s misfortune. To balance that, Steve Carell plays another banker profiting from the housing collapse but he’s very aware of and concerned by the moral implications of that. This is a fast edited film; lots of quick, jumpy shots which frustrated me greatly before we got into the characters. It is clearly meant for the short attention span crowd, and yet it still worked. It’s a smart movie, it’s a funny movie, and it’s an entertaining movie about the entertainment crisis.